My kids got out of school this week and you would have thought we rung the opening bell on the floor of the New York Stock Exchange. Papers flying, book bags crashing into the back of the closet, bikes propped all over the driveway and a desperate hunt for a functioning sprinkler. After months of learning math and reading and science and art, they were ready to take a break and just play. And I don’t blame them. Sometimes I wish I could do the same thing. Our family takes a vacation a couple times during the year and we certainly enjoy our weekends, but there are many times when I crave a month-long pause button in my professional life. In many parts of the world, such as Italy, France, and Spain, business, schools, and churches shut down for the afternoon so employees can rest and enjoy a leisurely lunch with their family. Even China, a country known for mass production, considers an hour-long nap at their desk after lunch to be somewhat of a legitimate right. As an entrepreneur in America, that seems laughable. While companies like Google and Nike are pursuing the idea of building nap time into their employee’s schedules, most corporations and small business owners would balk at the idea. There are many risks you take when you Go Outside. Financial. Relational. Spiritual. Physical. But one of the greatest threats that tend to sneak up on us the quickest and hit the hardest is burnout. Burnout may look different from person-to-person, but we all know it when we see it. A pastor who refuses to take a step back to care for themselves and their family and ends up leaving the ministry altogether when the years of self-neglect pile up too high. An executive who pushes and pushes their products, services, and ideas around the clock, only to wake up one day and wonder how they strayed so far from their original vision. A mom who looks after little ones (or teenage ones) and battles exhaustion and anxiety daily, with no end in sight. 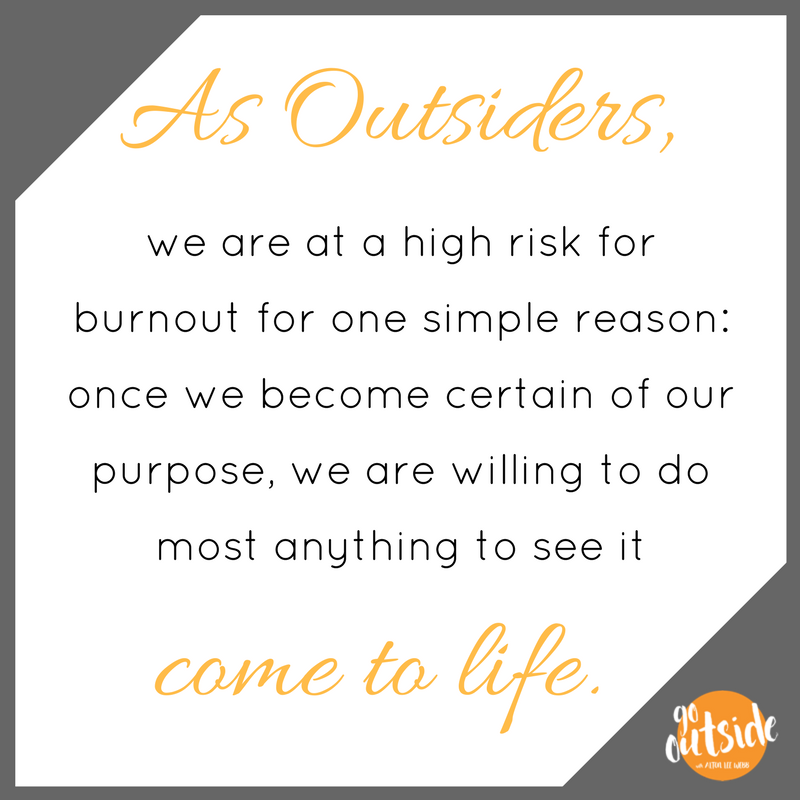 As Outsiders, we are at a high risk for burnout for one simple reason: once we become certain of our purpose, we are willing to do most anything to see it come to life. Often times, that fervor causes us to view life as a sprint. We take off with white-hot passion, running over the coals, jumping the fence, pushing off the walls. We go all in, all at once. But at some point, our feet and legs grow tired and we realize we are not Chuck Norris. This is the moment when we tend to do one of three things – power through with no regard to the risk to ourselves and those around us quit altogether, or take a break. Maybe you are reading this and you just starting your journey outside – you are trying to figure out what you are supposed to do and where you are supposed to go. But maybe some of you have been pounding the pavement for a long time. Maybe you are worn down and drained and wondering when things will ease up. From the time I was a child, I remember hearing the story of creation and how God worked beyond comprehension to create the planet and the animals and mankind in just six days. Sounds pretty grueling to me! Good thing God is all-powerful and he doesn’t need a breather. I was always confused when they explained that God rested on the seventh day of creation. Forgive me for stating the obvious, but that kind of makes me think that we should take some breaks too. But what rest look like? Maybe you are in a situation where you can go home and take a daily siesta (If so, I admit my jealousy) or possibly your boss will let you have an extended two-week vacation in June. Great! But most of us have to be creative with the means we use to find respite. Here are five practical ways that I have built rest and breaks into my routine. Take or leave them – or even better, comment and share your strategies for avoiding burnout. 1. Protect your most important relationships. I put this at the top of the list because it was one of my greatest concerns when we planted the church. I was already running a business and, like many starters, I can tend to be task-driven, which helps me get things done. But it also creates opportunities for me to neglect dates with my wife or be too worn out for quality time with my kids. I know this is an area of risk, so I am very deliberate about carving out time to eat breakfast with our two-year-old, to grab coffee with friends, to play Barbies with my daughter, to throw baseball with my eight-year-old, to drop a diet coke off to my mom or to sit on the couch with my wife for a few minutes when we get home. All of these things are seemingly small and do not require large chunks of time, but if I neglect these everyday touchpoints, I find myself feeling disconnected from the people who know and love me most. 2. Sleep, exercise and eat healthy-ish. This sounds overly-practical, and it is, but getting a consistent baseline of sleep (for me, it’s 7-8 hours), exercising (for me, it’s a short run in the morning) and keeping my crappy food consumption under control helps me beat back exhaustion, anxiety, and impatience. This has been a challenge for us with small children, but when I make these three things a priority in my day, I am much more prepared to deal with the unexpected stress and demands of going outside. 3. Have a mentor. Give at least one person (outside your immediate family) an all-access pass to your life. I am grossly dependent on counsel I have received from mentors who have spoken wisdom and truth into my role as a husband, father, pastor and businessman. Not to say it’s easy to have a mentor. It takes time and vulnerability, and sometimes it’s hard to find the right person. But a mentor will provide the encouragement and insight to keep you on track as they are in a position to tell you things that your family or friends may not. A mentor will be one of the first people to sound the alarm when you are approaching burn out. 4. Delegate. Hand stuff over. Invite people to take part in your vision. Know up front that sometimes they will mess it up. But let them help you anyway. Let me assure you that this does not mean you have to give away your vision. Own that and guard it if necessary. But by all means, give other a people a seat at the table. And I’ll take it one step further and encourage you to delegate the tasks AND the credit. Crazy stuff can happen when no one is worried about getting the recognition. 5. Spend time with God, daily. I love food. I know I said to eat healthy, but sometimes I get out of control and stuff my face to the point of sickness. When that happens, I usually skip the next meal. But no matter how full I feel, I am always hungry again the next day. I can’t think of a single time that I woke up and thought “man, I ate so much yesterday, I really don’t need to eat today.” Why do we think we can gorge on time with God – packing in prayer when we have a bad day, reading scripture continuously for a weekend at a Christian conference, etc. – and think that will keep us full and satisfied for days or even weeks on end? The most certain way to avoid burnout is to stay connected with the giver of life and energy and vision through prayer and reading the Bible. Sounds old fashioned and rules-based, but it’s not. It’s extremely relevant and relational. The key for me is realizing that spending time with God can happen anywhere. In my car on my way to a meeting. Visiting with neighbors in the front yard. Recording a podcast. Giving my kids a bath. It’s a constant conversation. As for reading the Bible (which we probably shouldn’t do while we drive or mow the lawn), we seem to live in a world where many people of faith seem to go about it one of two ways – an overly academic/intellectual approach or a quick/feel-good social media quote approach. It doesn’t have to be either. I find that when I open my Bible and read a chapter or two, God shows up every time. I hope each of you are able to find rest and encouragement this summer. We are considering several opportunities for our family on the personal and professional front. Rachel is especially excited about an opportunity to work with local refugee families through our church. We have so much to learn and understand about people from other cultures. Please pray that we are connected with a family that we can love on – and that we will learn the lessons that God wants to teach us through them as well. I set boundaries in my life for the important things, to make sure they stay a priority. Example: very, very seldom am I not home for supper with the family. Very seldom do I schedule weekends for what I want to do. Always check with my wife first before putting something on my weekend calendar. Schedule the big rocks well in advance. Time for planning, vacations, Spiritual Development. By scheduling well in advance they are locked in the schedule. Thanks, Lee. Very helpful for me with Jessica leaving for college soon. While I have these resources, I don’t consistently put them into action.